The SPHERE instrument on ESO's Very Large Telescope (VLT) in Chile allows astronomers to suppress the brilliant light of nearby stars in order to obtain a better view of the regions surrounding them. 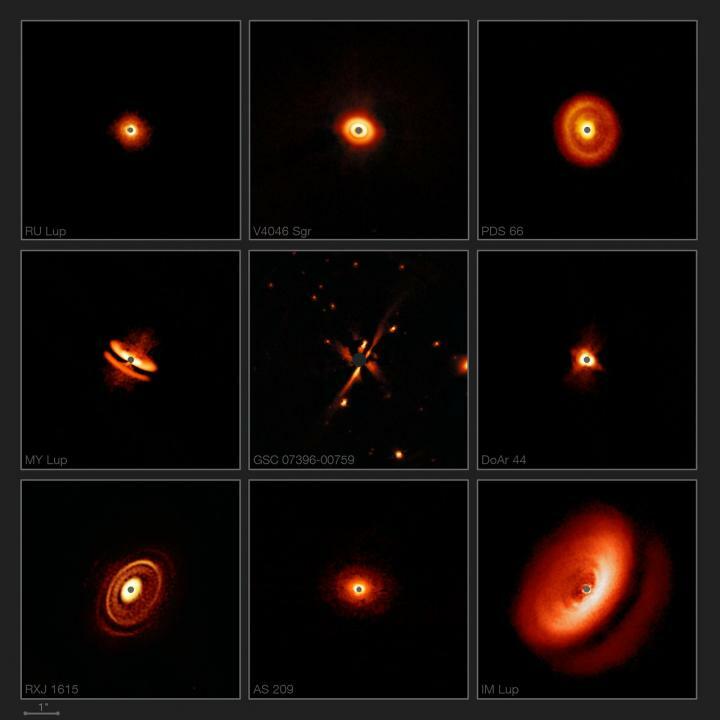 This collection of new SPHERE images is just a sample of the wide variety of dusty discs being found around young stars. SPHERE's primary task is to discover and study giant exoplanets orbiting nearby stars using direct imaging . But the instrument is also one of the best tools in existence to obtain images of the discs around young stars — regions where planets may be forming. Studying such discs is critical to investigating the link between disc properties and the formation and presence of planets. The new results from SPHERE, along with data from other telescopes such as ALMA, are revolutionising astronomers' understanding of the environments around young stars and the complex mechanisms of planetary formation. The images of T Tauri star discs were presented in a paper entitled "Disks Around T Tauri Stars With SPHERE (DARTTS-S) I: SPHERE / IRDIS Polarimetric Imaging of 8 Prominent T Tauri Disks", by H. Avenhaus et al., to appear in in the Astrophysical Journal. The discovery of the edge-on disc is reported in a paper entitled "A new disk discovered with VLT/SPHERE around the M star GSC 07396-00759", by E. Sissa et al., to appear in the journal Astronomy & Astrophysics. The first team is composed of Henning Avenhaus (Max Planck Institute for Astronomy, Heidelberg, Germany; ETH Zurich, Institute for Particle Physics and Astrophysics, Zurich, Switzerland; Universidad de Chile, Santiago, Chile), Sascha P. Quanz (ETH Zurich, Institute for Particle Physics and Astrophysics, Zurich, Switzerland; National Center of Competence in Research "PlanetS"), Antonio Garufi (Universidad Autonónoma de Madrid, Madrid, Spain), Sebastian Perez (Universidad de Chile, Santiago, Chile; Millennium Nucleus Protoplanetary Disks Santiago, Chile), Simon Casassus (Universidad de Chile, Santiago, Chile; Millennium Nucleus Protoplanetary Disks Santiago, Chile), Christophe Pinte (Monash University, Clayton, Australia; Univ. Grenoble Alpes, CNRS, IPAG, Grenoble, France), Gesa H.-M. Bertrang (Universidad de Chile, Santiago, Chile), Claudio Caceres (Universidad Andrés Bello, Santiago, Chile), Myriam Benisty (Unidad Mixta Internacional Franco-Chilena de Astronomía, CNRS/INSU; Universidad de Chile, Santiago, Chile; Univ. Grenoble Alpes, CNRS, IPAG, Grenoble, France) and Carsten Dominik (Anton Pannekoek Institute for Astronomy, University of Amsterdam, The Netherlands). The second team is composed of: E. Sissa (INAF-Osservatorio Astronomico di Padova, Padova, Italy), J. Olofsson (Max Planck Institute for Astronomy, Heidelberg, Germany; Universidad de Valparaíso, Valparaíso, Chile), A. Vigan (Aix-Marseille Université, CNRS, Laboratoire d'Astrophysique de Marseille, Marseille, France), J.C. Augereau (Université Grenoble Alpes, CNRS, IPAG, Grenoble, France) , V. D'Orazi (INAF-Osservatorio Astronomico di Padova, Padova, Italy), S. Desidera (INAF-Osservatorio Astronomico di Padova, Padova, Italy), R. Gratton (INAF-Osservatorio Astronomico di Padova, Padova, Italy), M. Langlois (Aix-Marseille Université, CNRS, Laboratoire d'Astrophysique de Marseille Marseille, France; CRAL, CNRS, Université de Lyon, Ecole Normale Suprieure de Lyon, France), E. Rigliaco (INAF-Osservatorio Astronomico di Padova, Padova, Italy), A. Boccaletti (LESIA, Observatoire de Paris-Meudon, CNRS, Université Pierre et Marie Curie, Université Paris Diderot, Meudon, France), Q. Kral (LESIA, Observatoire de Paris-Meudon, CNRS, Université Pierre et Marie Curie, Université Paris Diderot, Meudon, France; Institute of Astronomy, University of Cambridge, Cambridge, UK), C. Lazzoni (INAF-Osservatorio Astronomico di Padova, Padova, Italy; Universitá di Padova, Padova, Italy), D. Mesa (INAF-Osservatorio Astronomico di Padova, Padova, Italy; University of Atacama, Copiapo, Chile), S. Messina (INAF-Osservatorio Astrofisico di Catania, Catania, Italy), E. Sezestre (Université Grenoble Alpes, CNRS, IPAG, Grenoble, France), P. Thébault (LESIA, Observatoire de Paris-Meudon, CNRS, Université Pierre et Marie Curie, Université Paris Diderot, Meudon, France), A. Zurlo (Universidad Diego Portales, Santiago, Chile; Unidad Mixta Internacional Franco-Chilena de Astronomia, CNRS/INSU; Universidad de Chile, Santiago, Chile; INAF-Osservatorio Astronomico di Padova, Padova, Italy), T. Bhowmik (Université Grenoble Alpes, CNRS, IPAG, Grenoble, France), M. Bonnefoy (Université Grenoble Alpes, CNRS, IPAG, Grenoble, France), G. Chauvin (Université Grenoble Alpes, CNRS, IPAG, Grenoble, France; Universidad Diego Portales, Santiago, Chile), M. Feldt (Max Planck Institute for Astronomy, Heidelberg, Germany), J. Hagelberg (Université Grenoble Alpes, CNRS, IPAG, Grenoble, France), A.-M. Lagrange (Université Grenoble Alpes, CNRS, IPAG, Grenoble, France), M. Janson (Stockholm University, Stockholm, Sweden; Max Planck Institute for Astronomy, Heidelberg, Germany), A.-L. Maire (Max Planck Institute for Astronomy, Heidelberg, Germany), F. Ménard (Université Grenoble Alpes, CNRS, IPAG, Grenoble, France), J. Schlieder (NASA Goddard Space Flight Center, Greenbelt, Maryland, USA; Max Planck Institute for Astronomy, Heidelberg, Germany), T. Schmidt (Université Grenoble Alpes, CNRS, IPAG, Grenoble, France), J. Szulági (Institute for Particle Physics and Astrophysics, ETH Zurich, Zurich, Switzerland; Institute for Computational Science, University of Zurich, Zurich, Switzerland), E. Stadler (Université Grenoble Alpes, CNRS, IPAG, Grenoble, France), D. Maurel (Université Grenoble Alpes, CNRS, IPAG, Grenoble, France), A. Deboulbé (Université Grenoble Alpes, CNRS, IPAG, Grenoble, France), P. Feautrier (Université Grenoble Alpes, CNRS, IPAG, Grenoble, France), J. Ramos (Max Planck Institute for Astronomy, Heidelberg, Germany) and R. Rigal (Anton Pannekoek Institute for Astronomy, Amsterdam, The Netherlands).